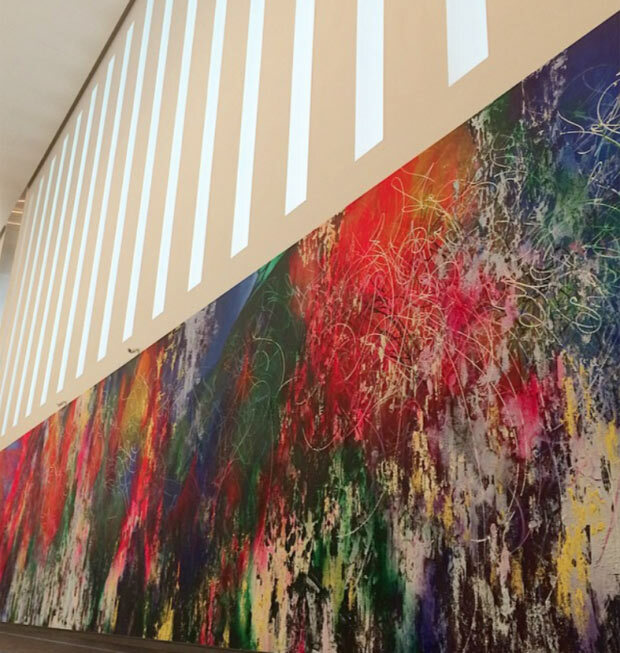 Mural painting by José Parlá in entry One World Trade Center, just amazing! 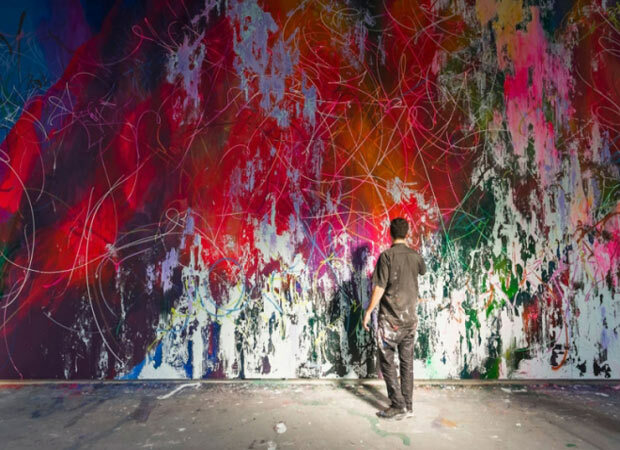 José Parlá (born 1973) has received critical acclaim for his works, which lie at the boundary between abstraction and calligraphy. Composed from layers of paint, gestural drawing and found ephemera, his work evokes the histories of urban environments. Parlá is a documentarian of city life. Using the backdrop of world cities, he re-makes in paint what can appear to be photorealist fragments of what he sees in the chaos and rush of the metropolis. His paintings reflect the accumulated memories and experiences, the walls that show a place that was, but no longer is — built over, renewed in some other configuration. Parlá paints revelations — transcriptions of the process — proof of the history of our neighborhoods. Parlá’s work shows that words, signs, and marks come to mean more; over time, in this symphony of diversity, both incongruous and in harmony, that surrounds our contemporary life. His practice originated in graffiti’s experimental and collaborative approaches during the eighties. These markings expose his drive to say or divulge the passing of time, in the moment. Recently, Parlá’s solo exhibitions have taken place in New York City at Bryce Wolkowittz gallery, Tokyo, Japan with Yuka Tsuruno Gallery and Haunch of Venison in London. The artist’s work is in the permanent collections of The British Museum, London; The Albright-Knox Art Gallery, Buffalo, New York, POLA Museum of Art, Hakone, Japan; and The Burger Collection in Hong Kong. In 2012, the 11th Havana Biennial selected the Wrinkles of the City: Havana, Cuba project, which was completed in the same year for a vertically integrated collaboration between Parlá and French artist JR, and exhibited in 2013 at Bryce Wolkowitz Gallery in New York City. Parlá and JR co-directed a documentary by the same title that was awarded the Grand Prize for Documentary Short and Best U.S. Premiere Documentary Short in 2013 at The Heartland Film Festival, Indianapolis, IN. This year The film was screened at the Istanbul74’ Arts & Culture festival in Turkey. Also in 2014, for the Caldera Arts Program at The Portland Art Museum Parlá collaborated with participating youth for his Signature Roots, workshop and installation. 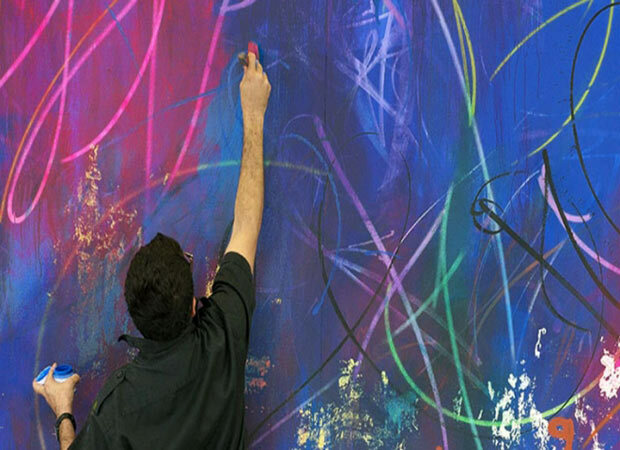 Parlá started painting in the early 1980s, exhibiting his works in the streets of Miami, and studied at Miami Dade Community College, New World School of the Arts and Savannah College of Art & Design. 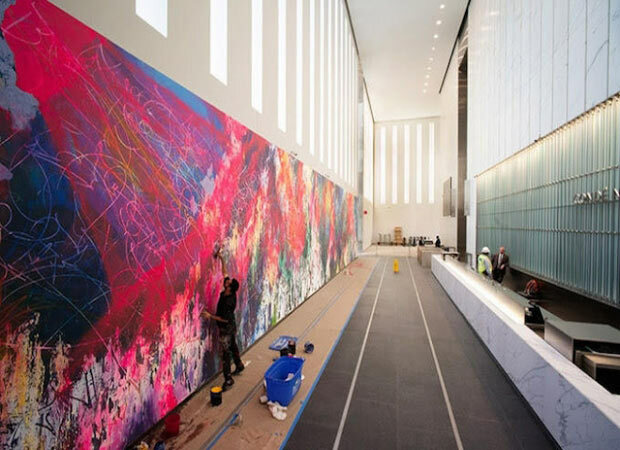 Parlá was recently commissioned by ONE WORLD TRADE CENTER for his monumental mural painting, ONE: Union of the Senses,(November 2014) the largest of it’s kind in New York City, in the tallest building in the Western Hemisphere, THE BARCLAYS CENTER in Brooklyn (January 2013) and the BROOKLYN ACADEMY OF MUSIC (September 2012), André Balazs’ Chiltern Firehouse, London, UK; North Carolina State University’s Hunt Library by SNØHETTA; and at Concord City Place, Toronto, Ontario, Canada. 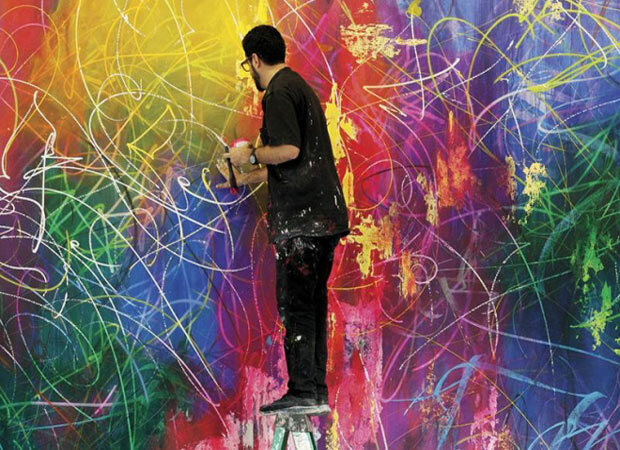 In 2013, MoMA curator Sarah Suzuki moderated the PopRally panel discussion, Writers and Writers: Narrative on the page and in the Streets, in which José Parlá participated in 2013. 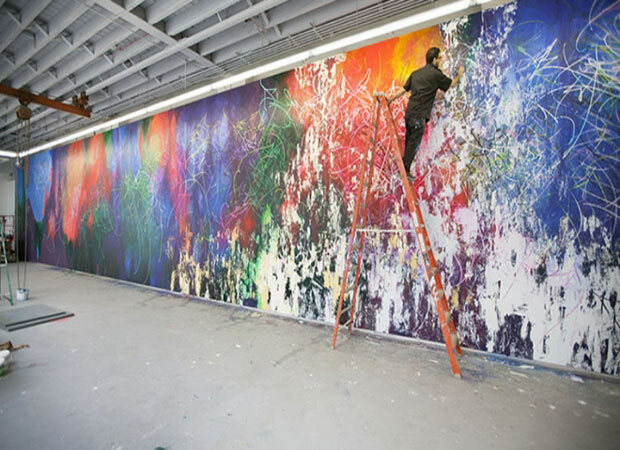 José Parlá lives and works in Brooklyn, New York.